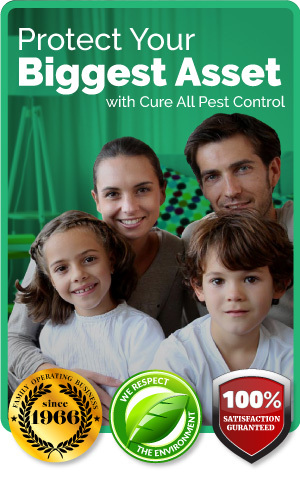 Spider Control – Eliminate spiders from your home! Removing spiders from your home will also remove any potential risks to your children and your pets. Cure All can eliminate spiders from an average Brisbane home from just $110. You are backed by our 3 month warranty. Queensland is in the midst of a Redback Spider plague. Due to the warm weather, rainfall and humidity, their food source; mosquitoes, flies and cockroaches have been thriving in numbers. Attracting more and more of the dangerous spiders, which are typically found in outdoor furniture and around the home. Black, long limbed with a bulbous body and a red/orange stripe spot on the upper and lower abdomen. Redback spiders pack a mighty venomous punch, causing agonising pain, vomitting, sweating, muscle weakness and nausea. Yikes!